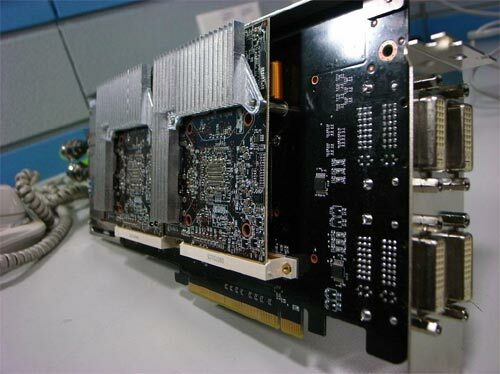 Check out this new prototype graphics card from ASUS which features not one, not two, but three RV670 cores cooled by a heat-pipe construction and a water block, all in a single card. The Asus EAH3850 Trinity features two cores on the back of the card and one on the front, the cores are cooled by heatsinks and heatpipes that transfers the heat away from the cores to the heatsink located in the rear of the card, which in turn is cooled by a water block. It also features four DVI ports which means you can use up to four monitors with it when CrossFire is deactivated. There is also a huge water cooling unit which is designed to fit into two 5.25 inch drive bays. If Asus release this card it is going to be a serious bit of kit and probably a very expensive one as well.